Review of Stone Vertical Epic 10.10.10 | Beer Apprentice - Craft Beer News, Reviews, Interviews and Info. For today’s craft beer review I thought I would open a bottle of Vertical Epic 10.10.10 brewed by the Stone Brewing Company located in Escondido, California. I realize that I’m supposed to wait until 12.12.12 to open this bottle, but I couldn’t resist. Plus, I have another bottle to open at that point, so forgive my impatience. I just wanted to see how this one has aged since it’s initial release date. Plus, I never reviewed it back then. The brewers website, stonebrew.com, doesn’t have the specific description of this particular vintage, so let’s refer to www.ratebeer.com for some information. This beer has an ABV of 9.5% and it comes in a 22 oz. bottle. It poured a hazy, dark yellow to orange color with a very bright white head that was soapy in texture, kind of fizzy and with small, tight bubbles. It was of good size from a fairly aggressive pour down the middle, but the retention time was a little below average and the lacing was rather meager. The nose on the 10.10.10 was very bright and fruity. It smelled of white grapes and green apples. A small fragrance of lemongrass and some kind of spice as well as a little bit of funkiness. It also had a very floral smelling bouquet too along with a nice dose of Belgian yeast, which helped deliver some enjoyable bready and biscuity qualities. Very pleasing!!! The taste generated more of the white grape and green apple aspects as well as a light lemon citrus. It seemed a tad tart and sour without ever becoming too acidic or astringent. It was very clean and bright with a suitable peppery spice. Additional tones of Belgian yeast, toasted breads, delicate grains and a touch of alcohol. Once the brew warmed a bit, the breadiness really started to come forth and meld well with the cutting fruit qualities. The mouthfeel was medium bodied, very dry, sparkly, sharp, refreshing, crisp and clean. A great amount of carbonation was felt at the front of the tongue, which remind me somewhat of champagne. A little bit of warmth was noticed from both the pepper and the alcohol, but it was never overbearing or distracting. The palate was left with a good dose of flavor long after the swallow. Well after a year since its initial release, we have a very good beer right here. It’s nicely complex and harmonized. The Belgian yeast and breadiness really compliments the fruity grapes and apples as this thing sat and developed in both the nose and the taste. It remains a sipper for me though. I had no problem finishing the bottle, but I never found myself taking big gulps or anything. Rather, it was more of a beer for relaxing on a lazy Sunday afternoon. 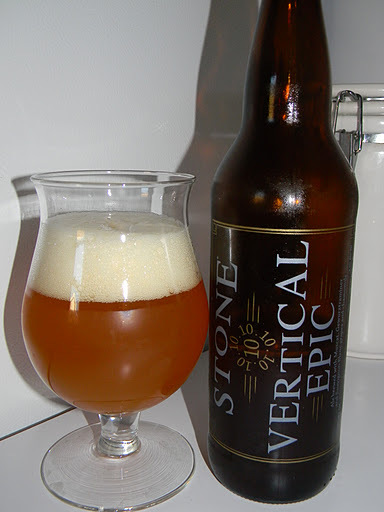 If you are able to procure a bottle of the Stone Vertical Epic 10.10.10, and have yet to try one, I would highly recommend it. I think you guys would like it. I can’t wait to see how my other bottle tastes in another year or so that’s for sure. Thanks for reading and commenting everyone. I appreciate all of the support.